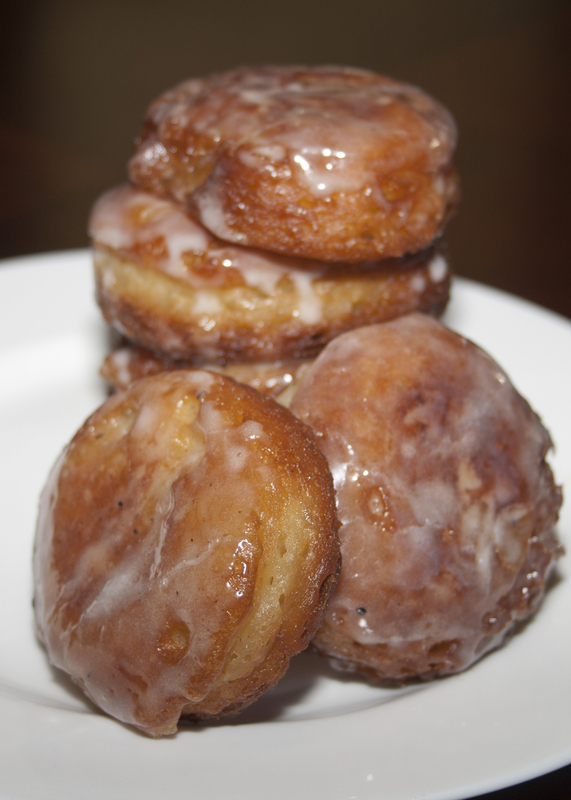 I decided to split the batter for this recipe in half and make some banana fritters and some apple fritters (with the help of a little can of apple pie filling). Here’s what you’ll need…plus oil for frying. Now, I have a deep fryer. But I know not all of you do. So, I decided to make these puppies the old-fashioned way. In a pan of oil. The most important (and tricky) part of deep-frying is the temperature of your oil. It will make or break your finished product. Oil temperature is regulated with a deep fryer – which is one of the biggest benefits of that particular gadget. For this recipe you want your oil right about 300°. I did a lot of trial and error to get you that number since it wasn’t anywhere in the original recipe. A photo is worth a thousand words, and so I give you the following as proof of the importance of oil temperature. So, to start off, get your oil going on the stove over medium(ish) heat. In a bowl, whisk together the eggs, milk, sugar and vanilla. 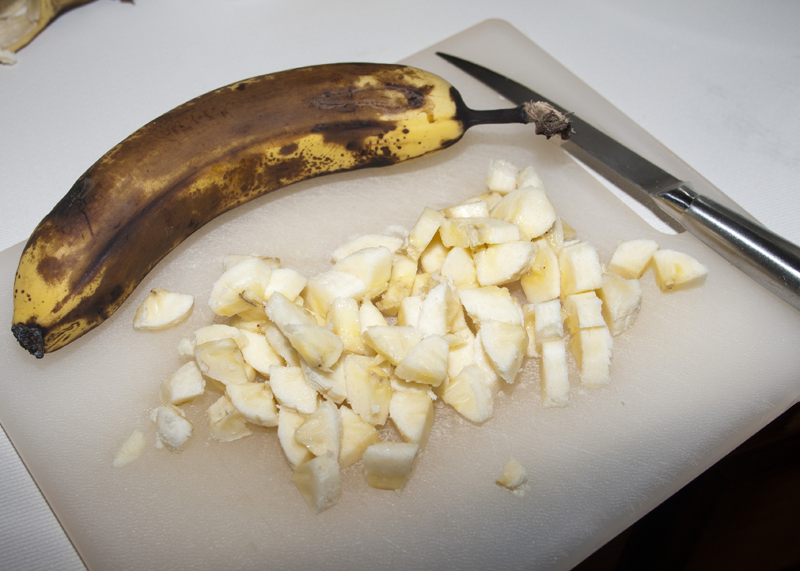 Then cut up your banana(s) and gently stir them and the baking mix into the wet ingredients. I used one and a half bananas for half the batter and added about 2/3 cup of the pie filling to the other half of the batter. Plop your batter into the hot (but not too hot) oil. You want to have fritters about 2 inches across. 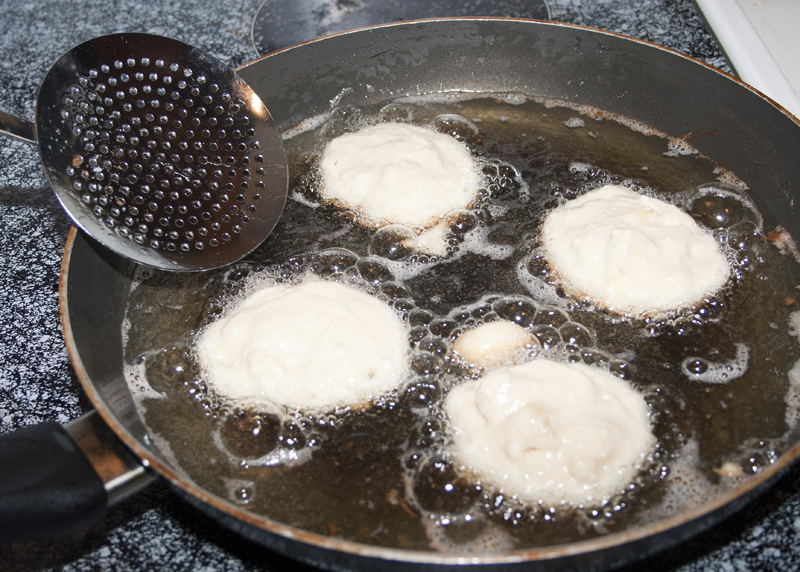 Using a metal scoop, flip the fritters over after about 3 minutes. 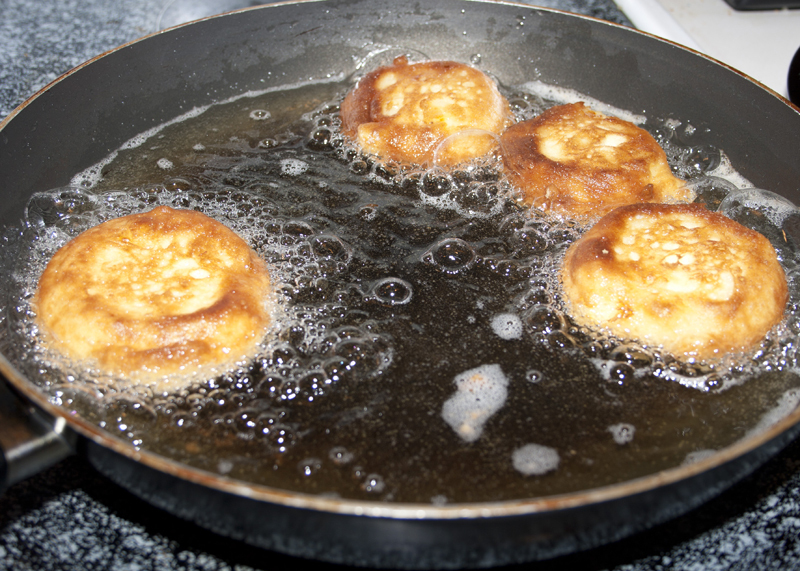 If your fritters are black, dark brown or anything close to that color, your oil is too hot. If they are pale still after that time, your oil is too cool. You want a nice deep golden brown color when they flip. Let them cook on the second side for another 2-3 minutes. Then remove to a wire rack set over a cookie sheet (to catch any oil that drips off) to cool slightly. 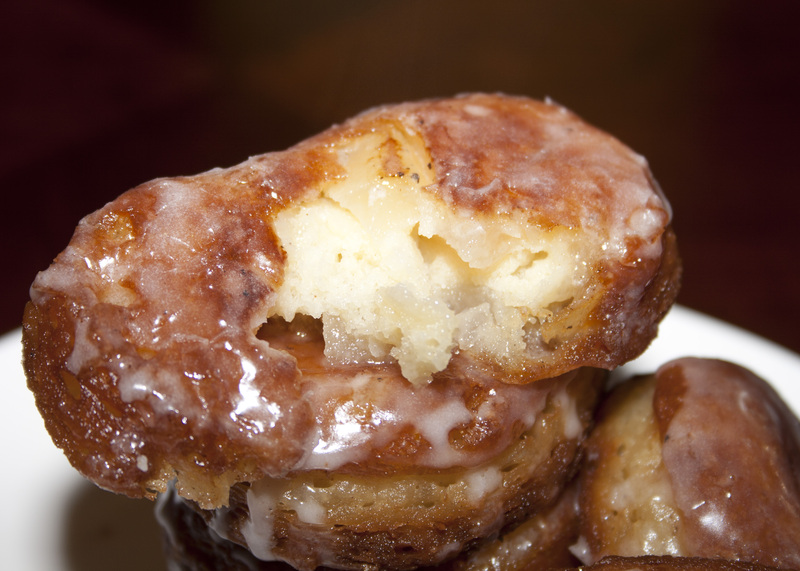 Whisk together your glaze ingredients and brush over the still warm fritters. Consume dozens. Seriously addictive and delicious. 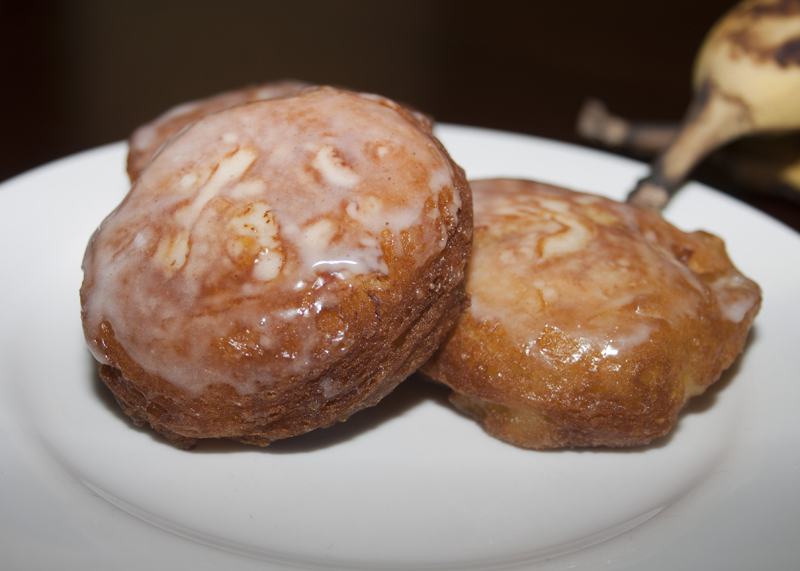 All crusty and golden on the outside with that sweetly spiced glaze. The warm soft interior bursting with fruity goodness. Mmmmmmm. Mmmmmmm! 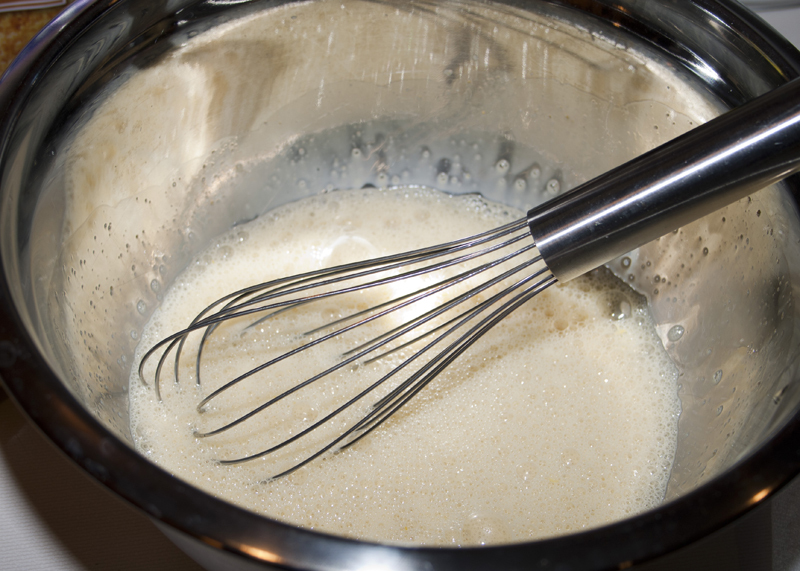 For the fritters: In a large bowl, whisk the eggs with the milk, vanilla and sugar until blended. 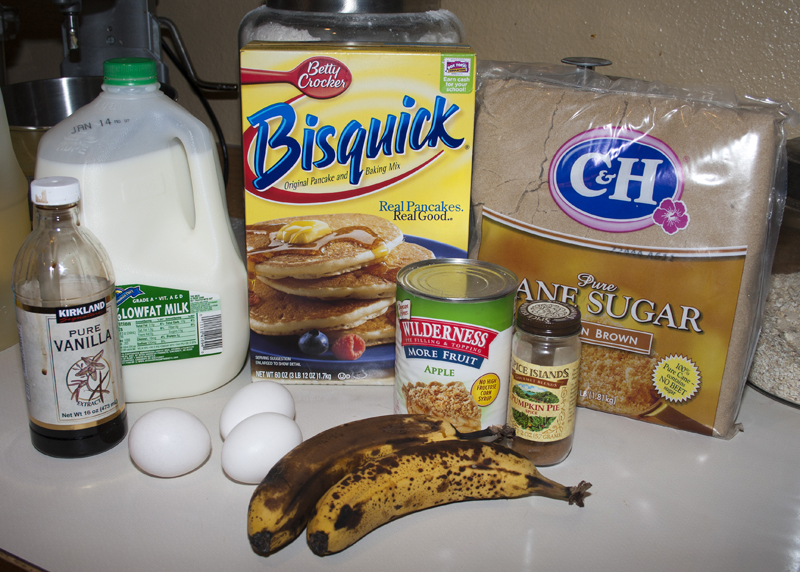 Stir in the baking mix and bananas until just combined. Heat the canola oil in a large, heavy-bottomed skillet over medium heat to approximately 300°F. Using a small melon scoop, drop the batter into the skillet. Fry in batches until golden brown and cooked through the center, 2 to 3 minutes per side. Remove from the oil and allow to drain on a wire cooling rack set over a baking sheet. For the glaze: Whisk together the powdered sugar, 1/4 cup milk and pumpkin pie spice. 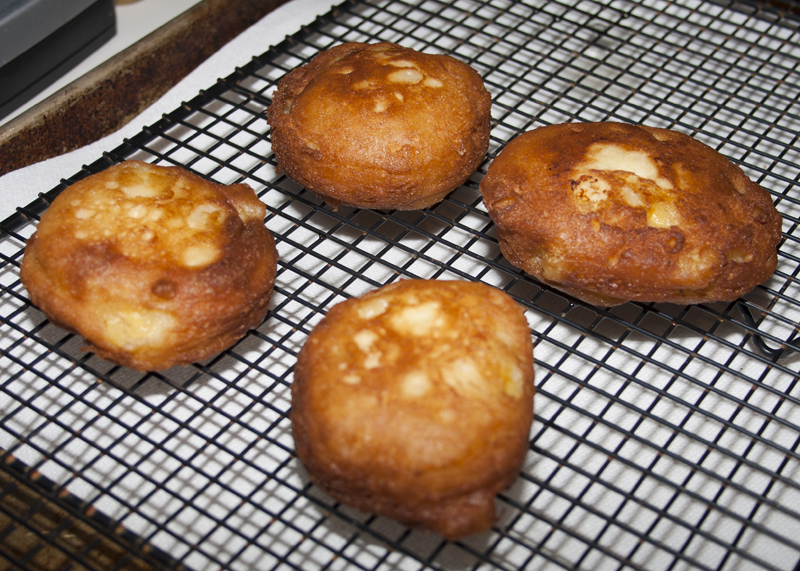 While the fritters are still warm, pour the glaze over top. Allow the glaze to set up slightly before serving.